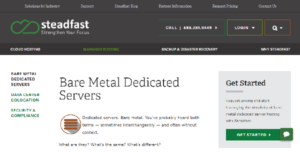 What is Steadfast Bare Metal Dedicated Servers? Steadfast Bare Metal Dedicated Servers provide users of all types hosting solutions that combine the benefits of dedicated servers and bare metal cloud hosting, combining the simplicity of dedicated server management and the versatility of bare metal clouds. Dedicated Server hosting provides users with a configured standalone server that is tailored to meet their needs and specifications. But this option is mostly reserved for power users and can be quite complicated in terms of set-up and deployment. On the other hand, bare metal servers are cloud-based servers that are totally customizable to help users meet shifting requirements, while not dealing with the fuss of managing multiple environments. Steadfast Bare Metal Dedicated Servers delivers the best of both worlds plus 24/7 Phone and Email Support, 99.99% Uptime guarantee, rapid support response, smooth migration, and OS patching among others. Steadfast Bare Metal Dedicated Servers offers an uptime guarantee of 99.99%. This promise comes with an industry-leading SLA that makes sure the users’ business services remain functional and are fully supported and protected. How Much Does Steadfast Bare Metal Dedicated Servers Cost? Every enterprise has its own characteristics, and may require a special solution that will be fit for their company size, type of clients and employees and even particular niche they cater to. You should not count on locating an ideal service that is going to be suitable for each business regardless of their background is. It may be a good idea to read a few Steadfast Bare Metal Dedicated Servers reviews first and even then you should pay attention to what the hosting service is supposed to do for your business and your workers. Do you require a simple and straightforward hosting with only elementary features? Will you actually use the complex functionalities required by pros and large enterprises? Are there any particular tools that are especially useful for the industry you operate in? If you ask yourself these questions it is going to be much easier to get a trustworthy service that will match your budget. We realize that when you make a decision to buy Hosting Services it’s important not only to see how experts evaluate it in their reviews, but also to find out if the real people and companies that buy it are actually satisfied with the product. That’s why we’ve created our behavior-based Customer Satisfaction Algorithm™ that gathers customer reviews, comments and Steadfast Bare Metal Dedicated Servers reviews across a wide range of social media sites. The data is then presented in an easy to digest form showing how many people had positive and negative experience with Steadfast Bare Metal Dedicated Servers. With that information at hand you should be equipped to make an informed buying decision that you won’t regret. Steadfast offers 24/7 Phone and Email Support. Their facilities are manned by expert system administrators and data center operations technicians around the clock and are always available via email and telephone. What are Steadfast Bare Metal Dedicated Servers pricing details? Do they enable you to effortlessly design a website with no HTML or coding skills? Steadfast operates an SSAE16-certified Security facility, built to help users achieve SOX, HIPAA, and PCI DSS compliance. Steadfast offers a 99.99% uptime guarantee.